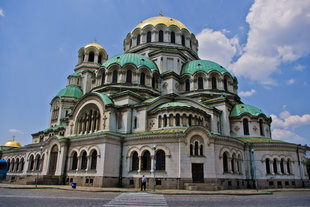 Saint Alexander Nevsky Cathedral is Bulgarian Orthodox church, located at the city center of the capital Sofia. Its cross-domed basilica rises over a central city square with the same name. This is the cathedral of the Bulgarian Patriarch. The interior of the temple is impressing with its beautiful marble from Italy, Morocco and Brazil. A lot of icons and frescoes can be seen inside. The gold plated-domes are the special feature of the temple and attract everyone’s attention. Its wooden gates are made of Slavonia oak and decorated with carvings. Reed more about Saint Alexander Nevsky Cathedral at the Official Tourism Portal of Bulgaria here.